Professor Elizabeth Stephens and partner Annie Sprinkle present the West Coast Premiere of their film Goodbye Gauley Mountain: An Ecosexual Love Story at the Del Mar Theater as part of the Santa Cruz Film Festival, Novemeber 7th at 7pm. For tickets for the film visit the Santa Cruz Film Festival site. To learn more about the film visit http://goodbyegauleymountain.org. 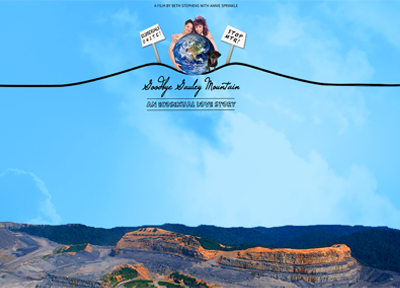 The film is about Beth's growing up in West Virginia and returning with Annie Sprinkle to fight a horrific form of coal mining called mountain top removal. Annie and Beth join together with hillbillies and activists to deploy performance, ecosexuality, love and sing-alongs to state troopers, to try to help save the Appalachian Mountains. This is the first queer documentary to take up our environmental future and the film was made to entice queers and artists to get involved, slow down and become more aware of the consequences of our actions in order to try to change the way that we are creating our environmental future.